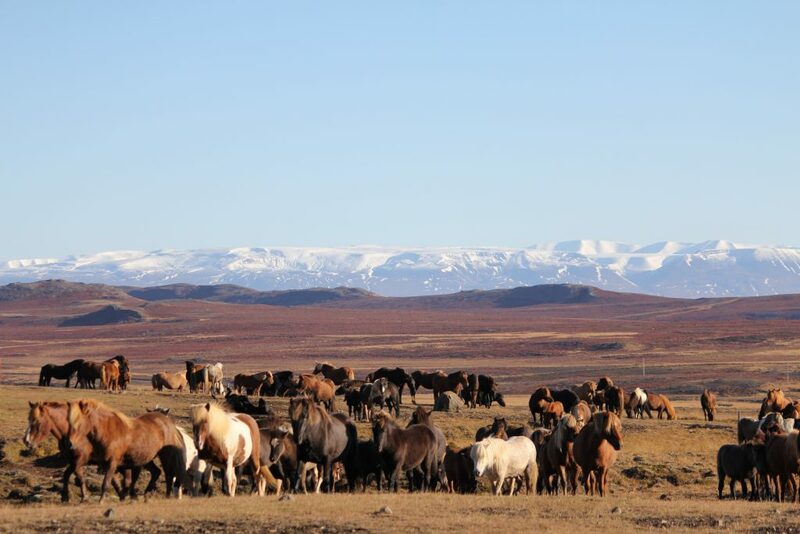 During the end of September, the free running horses are rounded up from the mountain Vatnsnesfjall, district of Vesturhóp in the Northwest of Iceland, to a fold and sorted out by their owners. Mares, foals and young ones give up the summer freedom before the winter returns. This is one of the traditional local events for horse farmers and a great experience for Horse Lovers. 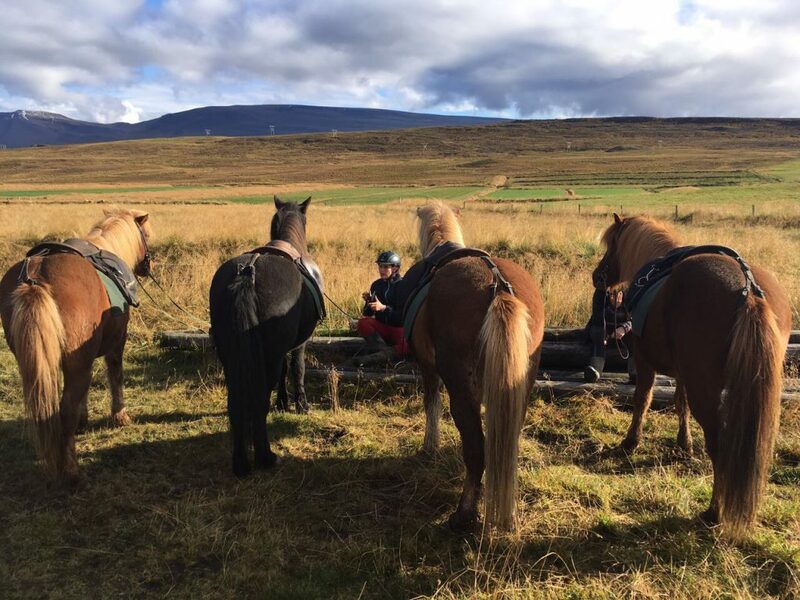 It is a good way to get to know Icelanders and some of their traditions intimately and the perfect opportunity for the Icelandic horse to showcase its talents! Full of energy, strong and sure-footed it is an irreplaceable partner for this work! You are welcome to take part in this adventure on horseback and at the end of the day, we will join a party with singing and dancing to celebrate the successful return of the horses. We offer you to experience this unique event – great autumn colors, traditional farm life and a lot of horses! Reception at the airport Keflavík between 15:00 and 16:30 or in Reykjavík around 17:30. Transfer to Brekkulækur (approx. 3.5 h.) and Dinner there. Night lodging (as for the following 5 nights) at horse farm Brekkulækur. We get acquainted with the horses with whom we will join the round up. The first part of the journey takes us – together with free running herd – along the river Miðfjardará and to the crossing of a fjord. Our riding horses stay on a pasture in Gauksmýri. On the way back to Brekkulækur we will visit the natural hot water pool in the village Hvammstangi. 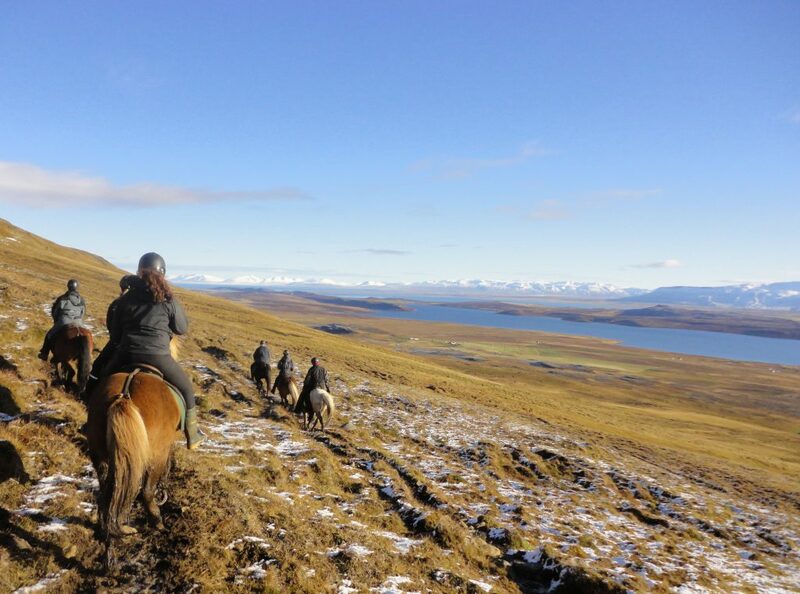 We take actively part in gathering the horses from the mountains, both on foot and on horseback. Our riding horses stay on a pasture, we go back to Brekkulækur. 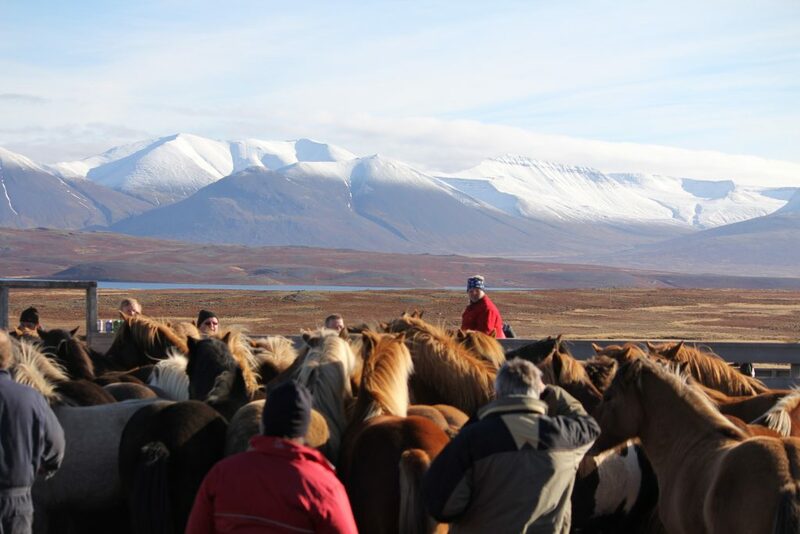 Now we help to drive the horses downhill to the pen Þverárrétt, where they will be sorted out by their owners. In the late evening, there will be a party and dance – a get together with the farmers! A long riding day back to Brekkulækur, with great views to the seaside and nice riding paths. Transfer to Reykjavík after breakfast and night lodging in a downtown guesthouse. Transfer to the airport, good-bye to Iceland and flight home.